I can’t remember where I first saw this done, but it’s another effect that you can use on type. You can use this on images as well, and perhaps you could do the Grunge Type and use this effect as well. You can go ahead now and add some effects to your text if you want. Once you have done that, turn off the visiblity of the b/ground layer and click on the text layer to make it active. Go to Select>Select All or use the keyboard shortcut of Ctrl + A then go to Edit>Copy Merged then create a new blank layer above your text layer by clicking on the new layer icon at the bottom of the layers palette – make sure that the layer is active, then go to Edit>Paste. 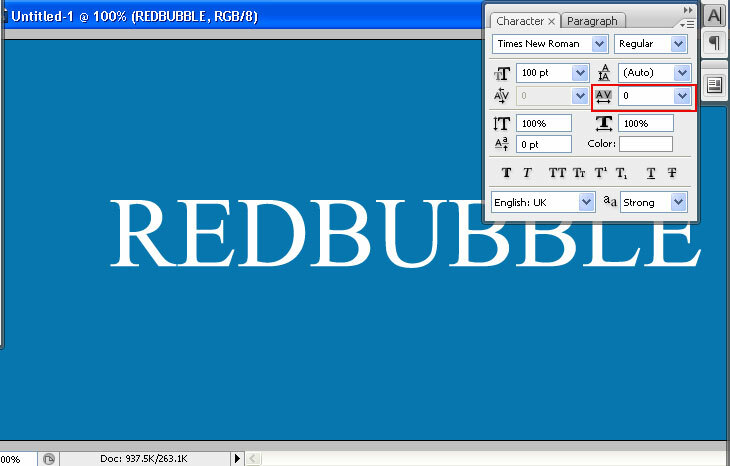 Turn off the visibility of your original text layer – and should have something similar to the image below. 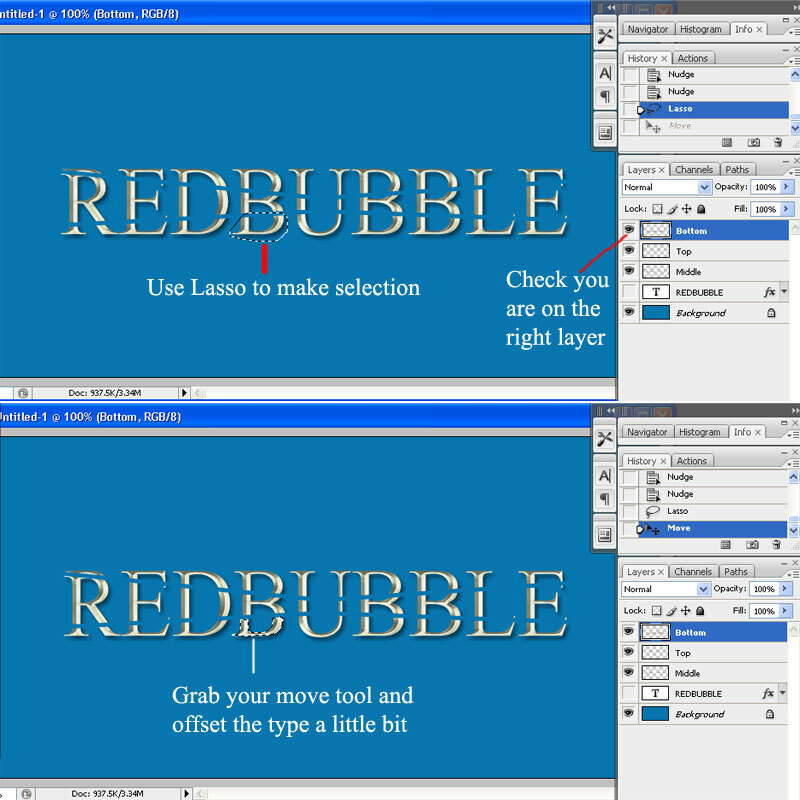 We’re going to use the Pen Tool now to make some selections with the text. It is painless (for those who dislike the pen tool). Make sure that once you have selected the Pen Tool that in the top toolbar it is set to Paths. Go ahead and make a selection similar to the one below – or however you want – I’m showing you how to create the effect it doesn’t mean that it is the only way that it has to done. Once you have closed off the path, right click inside the path and click on Make Selection, accept the default of 0 feather, anti alias checked and new selection. Once you get the marching ants go to Edit>Cut create a new layer above the merged layer by clicking on the new icon layer at the bottom of the layers palette, then go to Edit>Paste. Grab your move tool and position the text similar to the image below. It would also be worthwhile naming the new layer ‘Top’ and the copy merged layer ‘Middle” – or something that makes sense to you. Click back on the copy merged layer and do the same thing to the bottom half of the text – create path>make selection>Cut>new layer>Paste>move into position with the move tool – and perhaps name the layer bottom. Now you are going to move some of the pieces of the letters around to displace them a little. Grab your lasso tool and select which layer you are going to work on i.e. top, middle, bottom and lasso around part of the letter like in the image below – then grab your move tool and move it slightly, either to the right or left, up or down. Go ahead and continue moving the pieces of text that you want to move. I have over done the effect in the image below so you can see what is going on. I also used the transform tool on a couple of the pieces. Now you need to load the transparency of the layers you just worked on. If you have 3 like I do, and named them the same, you will be using Middle, Top and Bottom. Hold done your Ctrl key and click on the ‘Middle’ layer, then hold down the shift as well and click on the ‘Top’ and Bottom’ layers – you will see the marching ants appear. Click on the new layer icon at the bottom of the layers palette and then fill the transparency with a colour – any colour will do for now. Then drag the layer below the layers you were working on, and above the original text layer – you can now deselect and then duplicate the layer. Name one of the new layers Stroke and make sure that is the layer that is active. Then go to Edit>Stroke in the top menu bar and select width 2px, colour black, center, mode normal, opacity 100% – click OK. You will now have something similar to this image. You can carry on now and do some effects to the b/ground if you like – this is what I did to get the final image below. Working on the other layer that is filled with a colour … in my case layer 1…. I went to Filter>Sharpen>Unsharp Mask and really bumped up the sharpening Amount 500%, Radius 7.9 and Threshold 0. I then used Filter>Blur>Radial Blur … 100%, Zoom and Good. I then used the eraser to soften the effect near the outside edges. I turned the opacity down to 80%. I also named this Text Blur. I then created a new layer above the original text layer and drew a rough circle with the lasso tool, then I picked some colours and did a Filter>Render>Clouds. I then did the same as in the above paragraph. I changed the blend mode to soft light and took the opacity down to 80%. You can probably come up with a thousand better finishes than this ……. so go play! Added by admin on November 4, 2008.